The expensive Coventry Climax units used in the Lotus Eleven, inspired Colin Chapman (Lotus Cars founder) to design and develop the first Lotus built power plant. It was a 1,558cc version of Ford’s 1,498cc four with two Weber carburettors and a DOHC aluminium head — seriously high-tech gear for its time. Whilst being developed Ford saw the performance capabilities and requested Chapman to fit 1000 units to designated chassis for Group 2 homologation. In 1963 the Ford Cortina Lotus Mk1 was released. Offered in the hero livery of Ermine White and Sherwood Green this “Barn Find”, numbers matching and original right-hand drive Mk1 Lotus Cortina is the highly sought-after Aero-Flow model which was produced from 1964 with factory upgrades including a full width front grille, C-pillar aero-flow outlets, updated rear brakes and all new gearbox ratios. 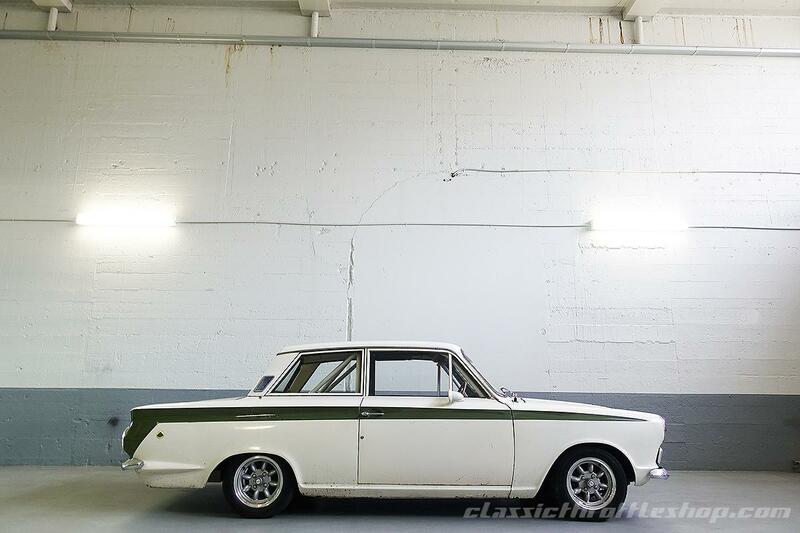 Delivered new to the U.K., where it stayed until 1989, this rare Lotus Cortina Mk1 was then imported to New Zealand where it was used often showcased under the ownership of a well-known enthusiast. The car was then converted to 1966 Group 5 specifications and raced as a Historic Touring Car. Throughout the 90’s the motorsport log book suggests it was very competitive, racing and winning at tracks like Mansfield, Pukekohe and even shipped to Australia to compete at Eastern Creek. The car was then imported to Australia by an enthusiast and avid collector, where it has remained ever since. First complied and registered in QLD the car had its original gearbox and rebuilt engine re-installed, it was put back on the road and used as a weekend driver. The car changed hands one last time and was sold to another collector with which it remained unused for the next 15 years. Accompanying the Lotus is two keys, a set of rare Dunlop magnesium-alloy wheels, MOT’s dated from 1970 to 1986, photographs, race logbooks, FIA papers, registration certificates and a host of parts and service receipts. The large compilation of history that comes with the car is incredibly hard to find and adds to its interesting provenance. With its original interior, timber rimmed steering wheel, chassis number still visible, numbers matching gearbox and engine this rare and authentic Lotus Cortina offers a blank canvas to restore one of the earliest and most collectable Fast Fords.